This single ball race design provides an economical, yet highly durable caster for light industrial use and a wide variety of institutional and commercial applications. They are used for dollies, laundry and food handling carts, light equipment and other mobile requirements. Construction: Heavy gauge steel deep formed for maximum strength. Swivel bearing: Hardened and polished steel balls in deep formed raceway designed not only to carry the load but also to absorb side thrust between the deeply embossed outer apron of the base and formed inner flange of the fork. Fork: Legs and fork are one piece pressed steel construction. King Pin: Steel rivet, orbitally formed to provide equal strength at both ends. Axle: A square neck under the head of the axle fits in a square hole in the leg of the fork which prevents the axle from turning. In addition, a steel sleeve fits over the axle (except for the 2” size) and is held rigidly between the fork members, thereby greatly strengthening the caster, preventing wear on the axle and providing a larger axle bearing for the wheel. Wheel bearing: Plain bearing wheels are sized to rotate directly on the sleeve described above. Straight roller bearing wheels rotate on a hardened and ground steel sleeve which provides a precision inner raceway for the bearing. Lubrication: Swivel is lubricated at the factory. Pressure fitting is provided in the wheel hub or in recessed head of hollow axle. Finish: Zinc plated finish for all parts except the wheel. Rigid Caster: One-piece heavy gauge steel construction, deeply formed and embossed to equal the strength and durability of the companion swivel caster. Dia. Face Type Load Cap. Plain Bearing Straight Roller Bearing Approx. Wgt. Plain Bearing Straight Roller Bearing Approx. Wgt. * With plain bearing reduce capacity by 100 pounds. The Series 52-A casters are used for heavy office and institutional equipment and for light to medium duty industrial applications. The double ball race swivel design assures easy motion in any direction and long service life. A full selection of both floor protection and metal wheels broadens the applications of this extremely versatile caster. Swivel bearing: A deeply formed, coined work-hardened ball race carries a full compliment of hardened and polished steel balls to carry the load and absorb side thrust. A matching lower race balances the load and absorbs the thrust providing easy swiveling and long life. Axle: A square neck under the head of the axle fits in a square hole in the leg of the fork which prevents the axle from turning. In addition, a steel sleeve fits over the axle and is held rigidly between the fork members, thereby, greatly strengthening the caster, preventing wear on the axle and providing a larger axle bearing for the wheel. Wheel bearing: Plain bearing wheels are sized to rotate directly on the sleeve. Straight roller bearing wheels rotate on a hardened and ground steel sleeve which provides a precision inner raceway for the bearing. Lubrication: Swivel is lubricated at the factory. Pressure fittings are provided in the wheel hub or in the recessed head of a hollow axle. 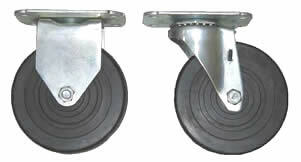 Rigid Caster: One-piece heavy gauge steel construction deeply formed and embossed to equal the strength and durability of the companion swivel caster. The Series 60-A casters are idel for light duty portable handling applications. They are particularly suited for use on hospital, institutional, food handling, factory and laboratory service equipment. This series is available with soft or ahrd tread rubber wheels or semi-steel wheels. The solid rubber wheels are available with self-lubricating bushings. Swivel bearing: Escalator ball races assure easy swiveling. The raceway is coined and work hardened for maximum wear. Axle: Bolt and nut axle construction. A key under the head of the axle fits securely into a hole in the leg of the fork to prevent the axle from turning. Wheel bearing: Plain bearing wheels are sized to rotate directly on the axle. Lubrication: Swivel is lubricated at the factory. 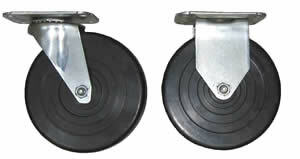 Rigid Caster: Two-piece construction with fork secured to the top plate; equal the strength and durability of the companion swivel caster. Dia. Face Type Load Cap. Plain Bearing Approx. Wgt. Plain Bearing Approx. Wgt. The Series 62-A casters are ideal for light duty portable handling applications. They are particularly suited for use on hospital, institutional, food handling, factory and laboratory service equipment. This series is available with soft or hard tread rubber wheels or semi-steel wheels. The solid rubber wheels are available with self-lubricating bushings.